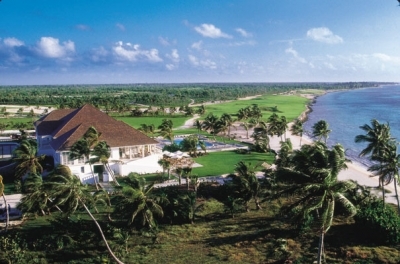 PUNTA CANA, DOMINICAN REPUBLIC � How many golf resorts feature their own international airport on the property? The 15,000-acre Punta Cana Resort and Club, located on the east coast of the Dominican Republic, is such a place. Punta Cana is the most highly visited Caribbean destination. The airport receives more than 100 international flights weekly from all over the world during the summer months and more than 250 flights arrive weekly during the winter months. Direct flights from the United States are available from New York�s JFK, Miami and Charlotte, North Carolina. Punta Cana Resort and Club is the vision of Dominican businessman and hotelier Frank R. Rainieri and Theodore W. Kheel, a prominent New York attorney and labor mediator. Their goal is to create a resort community that respects the natural habitat of Punta Cana while offering visitors a world-class vacation experience. Co-developers of Punta Cana Resort and Club are celebrities Julio Iglesias and Oscar de la Renta, both of whom have made Punta Cana Resort and Club their home. Looking toward the eighteenth green with the clubhouse and beach club beyond. The Resort features 420 rooms, sited in oceanfront and tree-shaded villas, on 105 acres of lush gardens. The property also includes eight restaurants for guests to enjoy and a full range of recreational activities. The P.B. 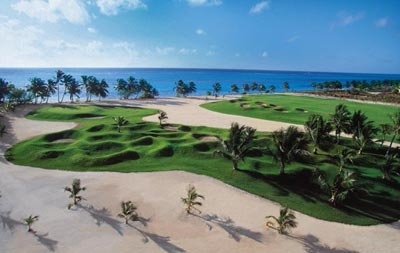 Dye designed La Cana Golf Course is the premier activity at the Resort. 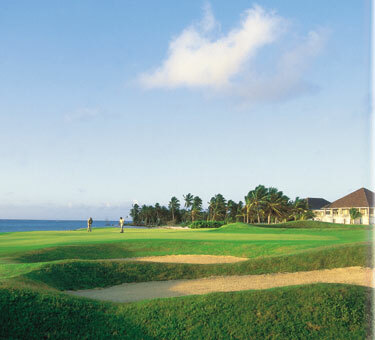 The course features views of the blue Caribbean from fourteen holes, with four of its most challenging right along the water�s edge. The design of the course resides in perfect harmony with the natural terrain of the land on which the resort is situated. Having the course positioned so close to the Caribbean allows the natural trade winds to play restlessly through the many palms on the course as well and in the minds of the golfers. The entire golf course, including the greens, is planted in Seashore Paspalum, a new hybrid grass that can be irrigated with seawater and requires very low amounts of herbicides. This grass provides a very playable surface similar to bermuda but with more forgiving rough. 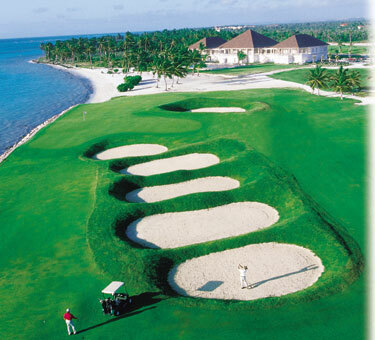 You don�t have to be a guest of the resort to enjoy the challenge of the La Cana Golf Course. I contacted the golf course to arrange a tee time and they sent a van to transport me from my hotel. Upon arrival, every detail of the service was first class. The club staff expedited the check in process and it was off to the practice range where I was introduced to Robin, my forecaddie for the day. He positioned my bag on the practice tee and cleaned each of my clubs as I warmed up for the round. After preparing on the range and the practice green, Robin accompanied me to the first tee by riding on the back of the cart with my clubs. He would ride along in that manner throughout the round. The par-four first hole, at 368 yards and playing down wind, gives you an introduction to the design features that will be seen throughout the layout while providing a birdie opportunity right out of the gate. The green complex features a natural limestone grotto just to the right of the green. Things become more demanding with the par-four second at 439 yards. The second shot is played down wind to an elevated green fronted by a waste area and backed by several large and deep bunkers. To complicate matters, a single palm tree stands guard in the fairway some forty yards short of the green. You just may surrender the birdie earned on the first hole. The par-three third is played to a green running diagonally away from the player with water fronting the green and guarding the entire left side. If you consider a safe shot to the right, no less than ten deep bunkers of various sizes await your ball. From there, a bunker shot back toward the water awaits. The course bears its teeth on the fourth hole, a 568-yard par-five played back into the wind blowing off the ocean. This may be the toughest of the par fives and carries the number one handicap rating. The tee shot is played from a tee box in a waste area to a fairway running diagonally away from you, framed by bunkers and grass mounds. Once positioned off the tee, the player faces a decision on his second shot. A waste area runs through the fairway between the 100-yard and 150-yard markers, meaning either a lay up behind or a busted fairway wood into the wind to clear. Either way, trees on both sides pinch the fairway to make the shot even more challenging. The green features dramatic undulation and is fronted by a deep pot bunker. This hole is all about survival. The par-three fifth, at 154 yards, would seem like just the break you need after playing the fourth hole. However, this is the first hole to be played right along the limestone and coral coastline with the green positioned hard against the sea. A strong right-to-left crosswind requires the player looking for a green in regulation to start the ball out over the ocean to ride the wind or play a cut to try and hold the green against the wind. Three is a very good score here. The par-four sixth hole plays 470 yards from the tips but is played dead down wind to a wide and firm fairway. This drive is a real ego builder after all the bruises earned over the first five holes. The second shot, also down wind, is played to a large green backed by a lake. 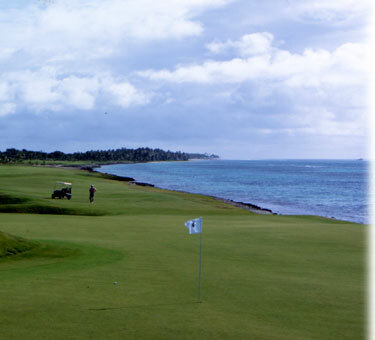 The par-four seventh hole is a classic risk-reward hole and is the feature hole at La Cana. The hole plays only 326 yards from the tips and is a severe dogleg left. The corner of the dogleg is protected by a grove of coconut palms and a deeply mounded and bunkered �Hecklebirnie.� (P.B. Dye calls this deeply pot bunkered no-man�s land �Hecklebirnie,� a type of purgatory according to Scottish lore.) A player may choose to play his tee shot to the fairway and have a relatively easy approach shot to the elevated green. This green also sits along a rocky stretch of Caribbean shoreline. The par-five eighth is fairly wide open and down wind. The green is hidden from the fairway by high mounding and a series of pot bunkers. Precision is critical on the approach shot but birdies can be had. The par-four ninth is played back to the clubhouse and features a green raised some thirty feet above the fairway exposing it to the wind coming off the Caribbean. The green is severely undulating and requires an approach to the proper green level for a good score. After a brief stop at the oceanfront clubhouse, I returned to the course to tackle the back nine. The par-four tenth is 390 yards but is played downwind. The green is fronted by severe mounding but is large and receptive to a mid-iron approach. The difficult par-four eleventh plays 456 yards. The tee shot can be played left off the tee to a relatively flat portion of the fairway but such a play leaves a very long second shot over water to the green. A more aggressive line off the tee, cutting off part of the dogleg over a waste area, will leave a significantly shorter approach shot but must be played from a side hill lie that will cause a poorly struck iron to go left into the water. A cautious player may wish to play three shots to the green and hope for the one putt. The par-three twelfth is a classic island green in the center of a large lake. The green is surrounded by a bunker and limestone rock. 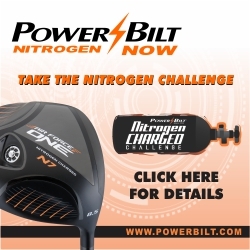 Shots that don�t hold the green can still be played. Though only 146 yards from the tips, this shot still presents a challenge because of the wind. The 437-yard dogleg right par-four thirteenth requires a tee shot to be played to the left (for all but the longest hitters) to avoid mounding and bunkers at the corner. This leaves a longer second shot played over a waste area fronting the green. The next hole is pure eye candy for the golf design junky. The par-three fourteenth plays from 239 yards to 115 yards, depending on your tees, but features obstacles that every golfer will have to stop and carefully consider. The ground between tee and green is a landscape that could have been inspired by a Jackson Pollack painting. P.B. Dye has used a pallet of sand, grass, mounds and native vegetation to paint a landscape of doom for any errant shot. A twenty-foot mound obscures the entire right side of the green and prevents all but the very best shots from reaching the putting surface. Many golfers will walk off this green scratching their heads and looking for the drink cart. P.B. Dye moved a lot of earth to carve out the dramatic par-five fifteenth. A properly played tee shot over a large hill to a hidden fairway will yield an opportunity to go for the green in two shots. This may be the last good birdie opportunity on the course so let it fly! The sixteenth is truly a man-sized par four measuring 484 yards from the tips and plays slightly up hill and into the wind. It is the only hole on the course without a bunker. With the wind, the hill and the length, it doesn�t need any. Walking off the sixteenth green, the player returns to the shore of the blue Caribbean and the final race for home. The par-four seventeenth plays 413 yards and has the limestone and coral shoreline protecting the entire left side of the hole. The tee shot is played to the right to avoid a large bunker on the left, leaving an approach back toward the sea to a narrow green that sits on the shore surrounded by more bunkers. The par-five eighteenth is a fitting end to a great golf course. Golf Magazine, in January 2002, said of this hole, �the grand par-five eighteenth, a gentle dogleg to the left, is clearly patterned after the famous eighteenth at the Pebble Beach, only here the shoreline is sandier, the water bluer, and the journey from tee to green longer and more perilous.� The hole features fifteen bunkers between tee and green. The final hundred yards is marked by a series of five large bunkers marching like soldiers down the center of the fairway. The green is guarded on the left by the sea and on the right by a final large bunker. Upon completing my round, I tipped my forecaddie Robin and gave him a sleeve of balls. I was invited to enjoy the beautiful Dominican afternoon while relaxing in the handsome beach and golf clubhouse, designed by a member of the Punta Cana Resort and Club family, Oscar de la Renta. The club staff graciously arranged transportation back to my hotel. As I left the clubhouse for the ride back to my hotel, I spotted Robin on the first tee, no doubt putting one of his new golf balls into play. Rates range from $102 to $139 depending on season with multi-round packages available. The cart fee is included. A forecaddie is included in the rate but is not required. I tipped my forecaddie $20 for his service.